← Barbados Tourism Authority should hire Tahir Quraishi NOW! Bajan Reporter removes Jesus cartoon… Why? About a month ago, the Bajan Reporter blog published an article critical of Barbados Free Press. We’d love to refer you to the article but the link is dead and the Bajan Reporter article with the “Jesus giving the finger” cartoon (copy above) has been removed from the internet. We assure our readership that BFP had nothing to do with the removal of the article. In fact, BFP embraced the Bajan Reporter article and expanded upon the BR’s published cartoon of Jesus giving BFP the finger. Enquiring minds want to know: Why did the Bajan Reporter remove the Jesus cartoon without so much as a word to let folks know? Is the editor frightened that Christians will turn violent over a cartoon of Jesus? Does he fear for his safety? Have there been threats from Catholic or Pentecostal congregations? Perhaps a rogue Seventh Day Adventist faction delivered an ultimatum? At this point, we’ll leave it to the editor of The Bajan Reporter to let folks know the simple truth that Bajans deserve to know. We at BFP believe that the Bajan Reporter is a vital and worthy contributor to the discussion of all things Bajan. We hope that BR respects their readership enough to address this issue. Answer the query about the Money Laundering? BFP says they did 3 positive Islam items, where? Ian has more integrity than all of us, he shows his face and combats victimisation, what about you? Me? Any of us who have nicknames instead? If it was anything to do with the Prophet Mohammed you would see how quick the Islamic residence would react, and worldwide too!!! Marcus, don’t promote drinking. It isn’t good and it isn’t funny! BFP everybody gets the idea of pychological terrorism and hypocrisy from radical islamists but maybe Bajan Reporter simply did it out of respect for other Christians at Easter time. Christ would not look good on his resurection day with his middle finger up in the air. Don’t you all have anything newsworthy? At least Ian, whose views I don’t always agree with, has the courage to write about Barbadian issues in the open. You BFP, are a bunch of hypocritical idiots who hide behind the internet and use the excuse of “victimisation by the authorities” to defend your cowardice. 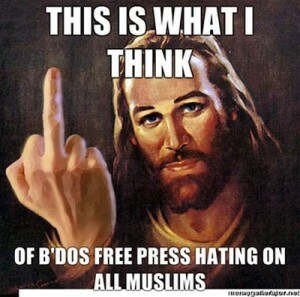 I understand that some folks might be offended by Ian Bourne’s cartoon of Christ at Easter or any other time and if Ian took the cartoon down for that or any other reason, we’d love to know – in light of our ongoing conversation about the dangers of Islam and Sharia. Meanwhile the recent events in Dearborn will either be a clarion to regain the rights and freedoms that the American people say they value so much, or, it will continue as an American submission to Islam’s violence. BFP, it’s a disgrace that wunna encourage dat *hit Bourne. Seems to me that, because he’s white, he can get away with anything on this blog whereas I, for instance, so often have my comments blocked. Wouldn’t be surprised if you don’t block this one too, or maybe you’ll think that the ariticle’s old and so hardly anyone will c it so u can publish it. BF, wunna really have to make up ur minds! Are you christian or aren’t u and, if u are, then tell Bourne to go n *uck heself and stop encouraging him! What’s the matter with you all. Are you in love with him or something! That cartoon’s obviously a disgrace!! Doan worry nothing about Jesus. He’s big enough to defend hisself, whether upside down in a jar of urine and called “art” or in Ian Bourne’s cartoon. The main point of this and our previous article about Ian’s cartoon is that Ian would never do a cartoon about Muhammed because the adherents of Islam are too violent and he would likely be attacked. It is ironic that Ian’s Jesus cartoon, which he meant to defend the Islamic faith, turned around to prove that Islam is an ideology that inspires violence. To Man wiv no name: As to Ian being whitish that is neither here nor there except in your crippled soul. Free your mind my friend, and all else will follow. The only chains of race upon you, Man wiv no name, are self-imposed. BF, u can talk garbage about race living in a majority black country. It requires somebody who, like me, lives in a majority white and very cosmopolitan country to comment on race so, I think I’m more of an authority on that subject than you and confirm that, in that respect, you’re talking garbage! Talk about what you know about, not what you don’t! As for Bourne taking advantage of our democracy to insult christianity – well, it confirms what I said – the man’s a *hit! Wow, such passion – can you do so in public to my face? Next! Obama Trumps Osama, step lively folks ya missed the Big One…. You’re up late like me, Robert. That wasn’t directed at you. It was directed at the man viv no name, but now that I read it is isn’t clear. I’ll edit it to make the meaning and the person it’s directed to more clear. Whatever philosophical disagreements some of us have with you Ian, we all respect you probably more than you realise. My great regret is that when we pass on the street or meet at Oistins I can’t tell you personally who I really am. You all accuse me of tearing down items from my side, but what about your latest salvo which I went to read once I came home? What you saw was a private conversation during the workup to a post that was accidentally and unfortunately posted in public for about an hour. A different situation than your issue with Jesus, for sure. We would really appreciate it if you would not republish that private conversation. No it was not a Private Conversation, I subscribe to your Story Alerts and that’s exactly what I got – be real, how can I be privy to your Private convo’s? You trying to infer I am part of the gang? What is that payback for showing you can remove stories which are too hot even for you?? Ian. I did not know it went out with the alerts. !@$! Ian, that was the early draft of an earlier story that is still up. We were using it to have a private conversation about the next story and somebody accidentally hit publish instead of “save draft”. So why did Marcus claim I was publishing a Private Chat? Either I hacked your system to do so or I am in on BFP, the first I am not capable of and the last though many feel is true – is far from reality. It was supposed to be a private chat. You were not part of it, but as we’ve seen the entire world and you became aware of it when ‘somebody’ (who shall remain nameless) accidentally hit the “publish” button instead of the “save draft” button. Our apologies for the confusion and our apologies to you if this caused you trouble. You were just the first person to mention it and we had no idea that it went out to everyone on the subscriber list. It has really hit the fan ’bout hey for obvious reasons. it is quite obvious that whoever made this cartoon or drew this picture doesn’t know Jesus at all. And since he doesn’t know Him, he shouldn’t use His name this way. Really? This whole dialogue was so very entertaining however, the use of someone else’s figure of religion in retaliation only shows that you are as low as they are. The honest truth is such a thing should have never been done it is obviously a petty attempt to cause controversy. It is people like the one who drew and published that stupid cartoon that give Muslims a bad name. If you all would begin to act like free thinking human beings you would admit that every man is entitled to his own opinions and beliefs and that there is absolutely no need to stoop to such petty levels of internet warfare. If racism is frowned upon so should this. Shame on you all!! No darling… it is the Muslims who murder, riot and destroy in response to stupid cartoons who give Muslims a bad name. That’s only my free thinking self speaking, and if it doesn’t match your standards, hopefully we can talk about it without Muslims initiating violence.